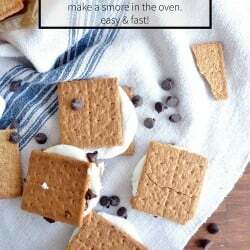 Can you make smores in the oven? Yes, yes you can! 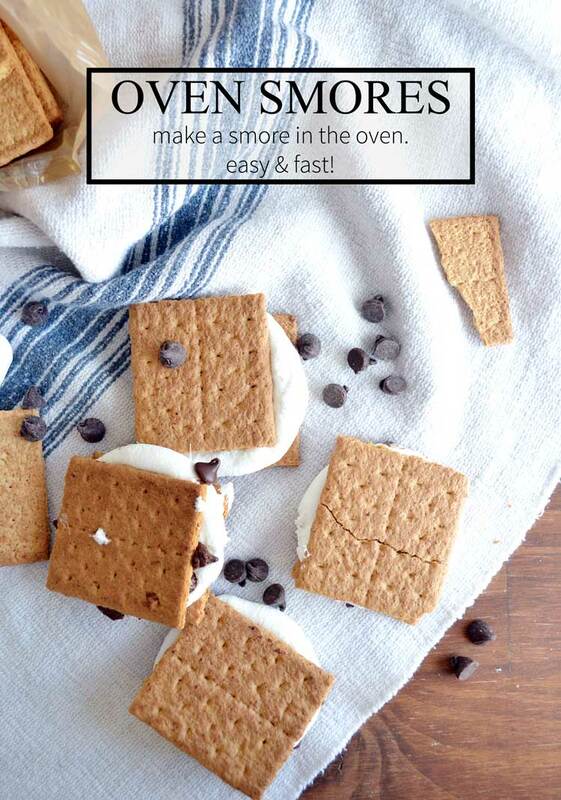 And when you live in the cold, cold state of Minnesota…you need to know how to make smores in the oven. 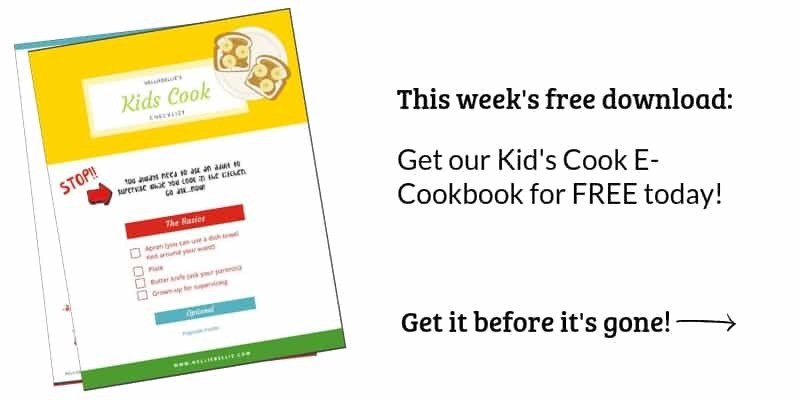 This recipe is easy, fast, and perfect for an evening in! Here in MN campfires are a summer fun activity. Come October and they become something of legends. Snow comes, cold comes, and a campfire exists in dreams. One of the saddest parts to our family about missing the campfires is the lack of s’mores. So come March, ever since the children were young we would have a camp night in the house and make smores in the oven. True, it’s not the same thing. But it’s pretty darn close. Kids love pressing their faces (don’t let them get too close!) to the oven door to watch the marshmallows expand. This is almost as fun as watching the marshmallows on the fire. We would do one at a time in the oven (as they got older they got smart and realized that a whole sheet could be made at once!) and have them pull up a chair, listen to music, and make it an event. We always like to make fun designs with our chocolate chips, at least when we use chocolate chips. Sometimes we use bars of chocolate instead. Making designs with the chips also makes it so everyone knows exactly which s’more is their’s, because apparently that matters. At least, my kids say it matters. And to be honest, it does seem to be a bit more fun making these when you are personalizing your own. Be sure not to cook these longer than the point of chocolate meltiness and marshmallow poofiness or you will get a nasty consistency on the chocolate. It’ll get weird and hard. Not good! 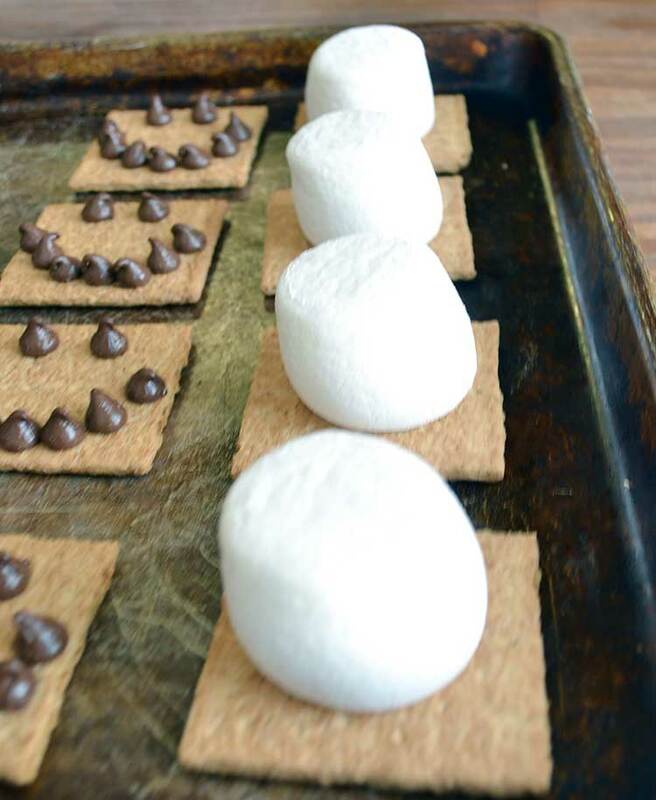 Place graham crackers on a cookie sheet, 2 squares per smore (one total cracker). Place chocolate on the other half. Bake in a 350 degree oven for about 7 min or until the marshmallow is poofy and the chocolate has begun melting. Put a marshmallow square on top of a chocolate square and press gently. Take them out of the oven as soon as the chocolate gets melty and the marshmallow expands. Don't over-cook or your chocolate will get strange. 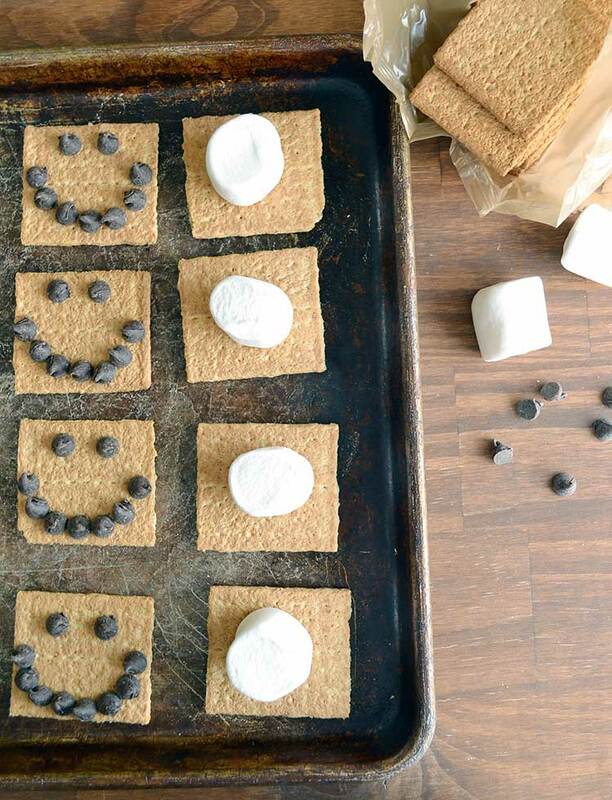 After seeing this post, smores are all I am craving. These look delicious! Thanks, Thalia! S’mores really are one of those craveable desserts, aren’t they?